National Academy of Sciences Report - See pp. 241-268 for the National Research Council's assessment of the disciplines of forensic pathology and death investigation. Death Investigation: A Guide for the Scene Investigator (2011) - U.S. Department of Justice, National Institute of Justice. A best-practices guide for death scene investigators produced by the National Medicolegal Review Panel, an independent multidisciplinary group of both international and national organizations whose constituents are responsible for investigating death. The Handbook of Forensic Service (revised 2013) - U.S. Department of Justice, FBI Laboratory Division. Provides guidance and procedures for methods of collecting, preserving, packaging, and shipping evidence and describes the forensic examinations performed by the FBI's Laboratory Division and Operational Technology Division. A Guide for Manner of Death Classification (2002) - National Association of Medical Examiners. 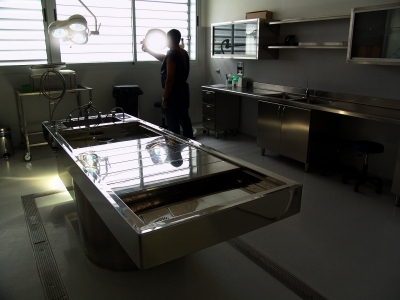 Drafted to improve uniformity in manner of death determinations for death certificates. View additional position papers and accreditation information on the NAME website. Scientific Working Group for Medicolegal Death Investigations - SWGMDI was created in March 2011 and is supported by the National institute of Justice (NIJ) through an Interagency Working Group with the FBI. Members are from local, state, or federal agencies, research institutions, or organizations which support medicolegal death investigations, and represent the medical examiner, coroner, medicolegal death investigator and forensic community at large. Strategic Plan for Improving the Medical Examiner System - this 2001 report by the North Carolina Medical Examiner Study Group was requested by the legislature in part in response to a series of news articles that raised concerns about the quality of death investigation in North Carolina. The report provides information about the structure and responsiblities of the Medical Examiner system and makes a number of recommendations for improving the system including improved training, utilization of trained death investigators, and assuring adequate resources for the performance of death investigation and autopsies throughout the state. The North Carolina Office of the Chief Medical Examiner has compiled and posted the pertinent NC General Statutes and Administrative Codes related to death investigation. Recent news articles - this page contains links to recent press coverage of local and national cases involving death investigation and forensic pathology. Post Mortem: Death Investigation in America - A series compiled by Pro Publica, in partnership investigation with NPR and Frontline that looks at the nation's 2,300 coroner and medical examiner offices and reports on problems identified with the system. Field Documentation of Unusual Post-Mortem Arthropod Activity on Human Remains - The Journal of Medical Entomology published this study in January 2015 on how markings from post-mortem bug activity can be mistaken for ante- or peri-mortem wounds or signs of trauma. Medicolegal Death Investigation Trainings - Live and online training sessions compiled by the National Institute on Justice. Most are available for free. Forensic Science Training - scroll to the bottom of this page to webinars on the topic of death investigation and forensic pathology. Visit the database of experts to find the contact information for experts in this field. Anatomy of the Human Body - Bartleby.com edition of Gray's Anatomy of the Human Body features 1,247 illustrations and a subject index with 13,000 entries. A Fly for the Prosecution - How Insect Evidence Helps Solve Crimes by M. Lee Goff - This book uses case studies to explain the process by which different species of bugs break down decomposing bodies.